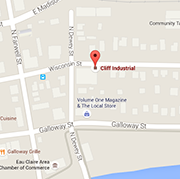 EAU CLAIRE, WIS., August 31, 2017– Cliff Industrial, the downtown Eau Claire machine shop, has expanded their machining services by acquiring Automotive Machine Works. Automotive Machine Works has been specializing in industrial and agricultural diesel engine repair since 1947. The recent acquisition now expands quality services to include small component part manufacturing, tooling, and machine repair to Northwestern Wisconsin and surrounding areas. Cliff Industrial’s acquisition of Automotive Machine Works advances its mission of providing regional businesses and consumers with quality parts and service. By merging Automotive Machine Works current services with Cliff Industrial’s machine shop capabilities, Automotive Machine Works will now be well positioned to deliver solutions to enterprises and consumers. Automotive Machine works and its employees will continue operations at their current location on Esmond Avenue. For more information regarding the acquisition, please e-mail info@cliffindustrial.com. Automotive Machine Works has been providing Northern Wisconsin with engine repair services since 1947. An authorized dealer of engine kits, cranks, pistons and more, Automotive Machine Works is your one stop shop for all machining needs. For more information about our engine rebuilding services, visit our website www.automotivemachineworks.com. Cliff Industrial has more than 35 years of experience building progressive dies, stamping and machining. Cliff Industrial was acquired by Senasys in 2016 expanding their services to include small component part manufacturing. Their abilities and versatilities have enabled them to accommodate many industries as well as work with a variety of metals from aluminum and brass to exotic metals like Inconel.